Ken Stilts was our co-host today and called the meeting to order, he said it has been a very long time since he was our President and called a meeting to order. Guests: Rotarians Bob and Ann Scott, from Cobourg, Ontario; Bruce Howard from the Cambria Club who is also our speaker; Dean Sullivan who is here for the fourth time; “Jude’s Dude”, Gordon, who has retired so he is available to come to Rotary; Jeff Cadwallader, Assistant Vice Principal at MBHS. Heidi presented a check to Jeff in the amount of $500 to support the Awards Banquet at the High School. Contact Katherine if you would like to go to the Dodgers game; we might be able to take a bus from here. We hope to have over 200 attending District-wide. 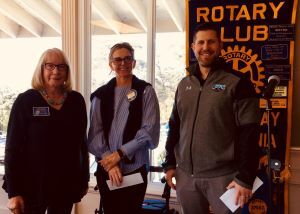 Mary and Jude went to the Atascadero Rotary Crab Feed and it was a beautifully run affair, except they didn’t do the bread right according to Mary, who admitted she is the “Crabby Crab” eater and wants things done right. Ours will be done right because it will be done at the Pizza Port. Four Way Test....Andrea is handling it and the deadline is April 1st, so we have a little more time than we thought we did. Daniel Bronstein gave an update on the Scouts BSA Troop for Girls he is starting up with help from Doug Riddell. We are the charter organization for this troop. He now has five girls who want to be involved which is the minimum to start a troop. Judy Salamacha said that Opal Singleton has written a new book about Human Trafficking. Her second book is Societal Shift, A World Without Borders and a Home Without Walls. Both available on Amazon and Judy also has a couple of copies. The fines were $10 for each person with a birthday in February. In addition to birthday fines, Mary Leizear for $25; Dan Costley for $20; Steve for $25; Jeff Jones for $20; Jack Keely, $20; Dale Reddell for $50; Ryan for $15; and Mike Shaffran for $20. John Weiss then introduced our speaker, Bruce Howard who John has known for over 18 years. Judy added that Bruce is in real estate and has lived in Cambria 20+ years. 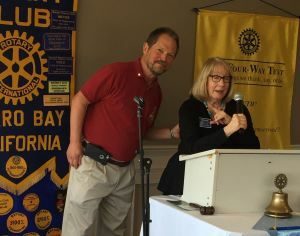 The Cambria Rotary Club, which is 50 years old, was started/sponsored by our Club. Bruce’s first occupation was as a flight attendant, he plays the drums and has sold many different percussion instruments. He is a concert promoter and has been on the radio for several years including years on K-Otter radio. He has promoted and personally knows many performers over the past 20 years. The Fremont Theater is like a theater that most small towns have with a seating capacity of approximately 800. They bring many special events to the Fremont which has been updated but still has its original charm. Bruce was a delightful speaker and we appreciate him taking the time to come to our Rotary Club. 50/50 was won by Ann Scott, our guest who gifted it back to our Polio Plus Fund. Ann and Bob Scott have been all over the world giving out polio doses and tirelessly fundraising to eradicate polio. Bob said only 30 cases were reported last year. Next week we will have Jody Cox, our new Police Chief. He has been Chief for about six months, so he is ready to talk to us about police business - hope to see all MBRC members next week. 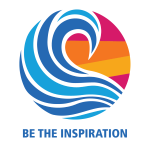 Jude says “Be the Inspiration” - a quote from MLK and Ghandi.